150 MILE RANGE | HDTV RECEPTION -- HD Antenna can capture 1080p HDTV and 32db high gain reception within 150-mile range, Full support 720p, 1080i, 1080p | Working Frequency: VHF 40~300MHz | UHF 470~890MHz | Receive free digital broadcast high definition digital antenna signals. EASY INSTALLATION -- Compact high-performance pre-assembled antenna design makes it easy to mount snap-lock elements and position for best reception. Easy-lock fold-out reflectors increase the signal strength and reduce signal dropouts. Comes with easy to follow user manual. 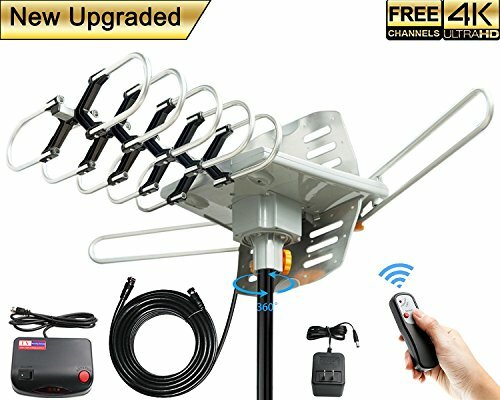 WEATHER RESISTANT -- 150 mile tv antenna is for outdoor using. HD Antenna outdoor is lightning protected, durable design with grounding done -don't get struck out by bad weather.